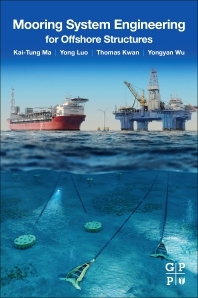 Mooring System Engineering for Offshore Structures delivers in-depth knowledge on mooring system engineering in oil and gas drilling, production, construction and renewable energy. Providing adequate information for daily offshore challenges, this reference gives beginners a solid look at the fundamentals involved, along with a literature review to fill in knowledge gaps. Topics include mooring designs with coverage on current standards and codes, mooring analysis, and theories behind a mooring analysis of quasi-static or dynamic approaches. Advancing on to the practical use of design criteria for strength and fatigue, this book summarizes the experience and lessons learned in installation, operation, inspection and maintenance. Both young and experienced offshore oil and gas engineers will benefit from the knowledge presented on the things they need to understand regarding the various types of mooring systems, their design, analysis and operations to run safely, efficiently, and at high performance. Dr. Kai-Tung (KT) Ma is a Senior Advisor at Chevron. He earned his BS from National Taiwan University, and MS and PhD from the University of California at Berkeley. With 25 years’ experience, he has previously worked for a few consulting firms as an engineer or manager, and American Bureau of Shipping (ABS) as a senior engineer. He has published over 35 papers and 4 patents in the areas of mooring engineering, reliability of marine structures, and drilling riser design. KT is a Fellow of SNAME and serves on the API and ISO mooring committees as chair and co-chair, respectively. Dr. Yong Luo is the founder and president of COTEC, Inc. that provides engineering services to the offshore industry. With over 25 years' experience, he previously worked for ABS, ABB, Noble Denton as Head of Hydrodynamics Dept, and SBM Offshore as Manager of Hydrodynamics, Moorings and Risers Group. Dr. Luo has published over 70 papers and is a visiting professor at Shanghai Jiao Tong Univ. and Harbin Engineering Univ. in China. He earned a BSc from Shanghai Jiao Tong University, an MBA from the University of Leicester UK, and a PhD from the University of Strathclyde UK. Dr. Thomas Kwan has over 40 years’ experience. He worked as a senior research specialist for Exxon on mooring and riser systems. From 1982 to 2006, he served as chair for the API mooring committee, leading the development of API RP-2SK, API RP-2I, and ISO 19901-7. He has been a lecturer in US and Singapore teaching mooring system technology. He earned a BS from Chu Hai College in Hong Kong, a MS and PhD from the University of Houston. He has published many papers. Dr. Kwan received the Albert Nelson Marquis Life Time Achievement Award in 2018. Dr. Yongyan Wu is a Principal Naval Architect of Aker Solutions as the Mooring System Lead. He holds a PhD from the University of Hawaii at Manoa, and MS and BS degrees from Shanghai Jiao Tong University. He has published over 20 papers in wave mechanics, wave/structure interaction, and station-keeping systems and is a registered professional engineer in the State of Texas. Dr. Wu serves as a technical editing panelist on the mooring committee for API and the Offshore Technical Committee for SNAME.